A review of the exhibition of prints running at the Herbert Art Gallery, Coventry until 11th January 2015. The People of India exhibit currently hung at The Herbert in Coventry (UK) comprises three separate bodies of work. The centerpiece of the show is a collection of street portraits by Coventry based press photographer Jason Scott Tilley. These are complemented by archive photographs taken by Jason’s grandfather Bert Scott – a photographer for The Times of India between 1936-40. Completing the exhibit are selections from a photographic survey (conducted 1868-1875) of ‘typical’ Indians commissioned by the then British rulers of India. Jason Scott Tilley is from an Anglo-Indian family. Between 1999-2009 he traveled extensively across India in search of his family roots and made striking photographs of people on the streets. Jason’s interest in India had been fueled by his grandfather, Bert Scott, who had told him stories of his life in India up until the time he fled to the UK, in 1947, to escape the increasing violence associated with partition (creating Pakistan in 1947). The real impact from this exhibit derives from the portraits Jason took as he traveled across the country. Many of them are of people Jason got to know, through repeat meetings, on his many trips. His relationship with each is glimpsed in the captions accompanying their portraits. Beggars, shoeshine boys, peddlers, musicians and others feature as dignified and proud individuals. Jason’s respect and admiration for his sitters is evident in both the images and words. When Bert Scott died in 2003, Jason discovered a cache of his photographs showing not only Bert’s own life (including his great first love Marguerite Mumford) but also showing how many important events he had photographed for the Times of India. These included the hand over of power, by Lord Mountbatten, to a newly independent India in 1947. The inclusion of Bert’s images in this exhibit serve to give context to Jason’s images in terms of his own family connections to India. But they do much more, in contrast with Jason’s contemporary images they make a powerful statement of the difficulties India has faced post independence. The persistence of poverty among a vast population and the inadequate infrastructure of the country can be seen in the subjects and the roads and buildings surrounding them. Finally, the 19th century portraits from the People of India survey deepen our understanding of the historical context of Britain’s imperial relation to India. 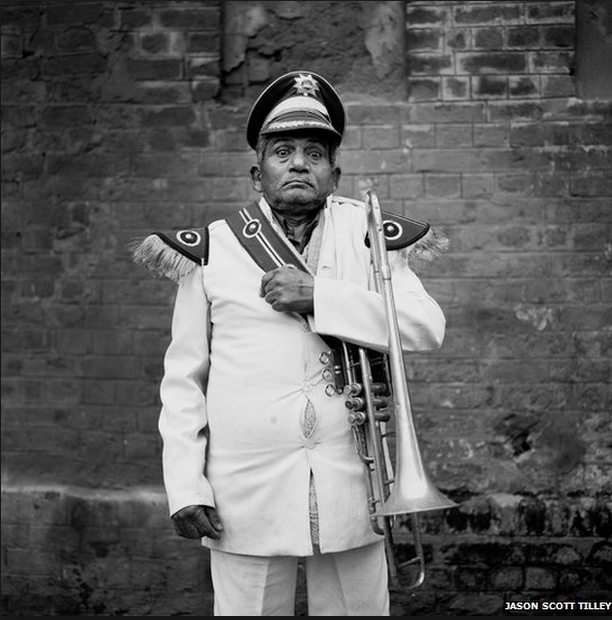 Almost inevitably, these portraits of Indian’s taken by photographer’s commissioned by their British rulers show a different power relation to the contemporary portraits by Jason. The people in these images were subjects in life not only in these single photographs of them. Ironically, a distant relative of Jason’s – the Reverend E Godfrey – was one of the photographers involved in the survey. The curators of The Herbert have done a wonderful job with this exhibition. In bringing together three complementary bodies of work they have deepened our understanding of each. The contrasts highlight the importance of history in understanding each set of images. In so doing, we come to appreciate the changing social attitudes informing each body of work. We can see the high arrogance of British rule, the revolutionary struggles for independence, to the more egalitarian and humanistic attitudes of Jason’s wonderful contemporary images. If you can, go see it. You will be richly rewarded. If not, you can learn more about Jason’s project – including video’s of his return to India with his grandpa – at his excellent The Beautiful People blog. You can view a selection of the images on the BBC web site here.